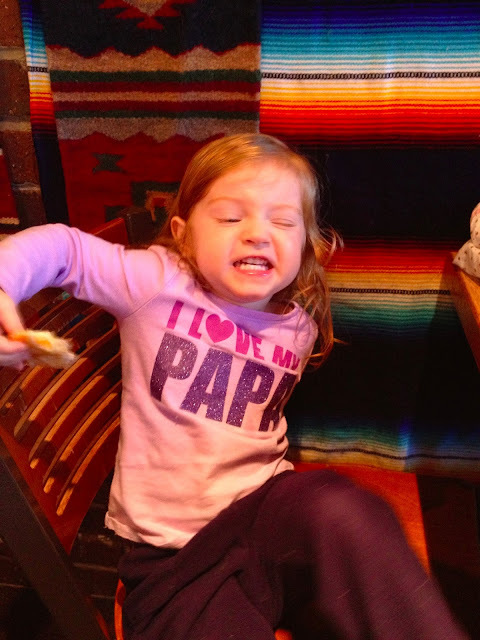 This post is for anyone that has ever considered taking their toddler out to dinner. Here’s some advice. Do not take your toddler out to dinner. Do not go out to dinner with other people with toddlers. Do not make eye-contact with toddlers in the restaurant. Let me walk you through what happens if you decide to follow through with such a foolish plan. Your child, who may have been calm on the way to the restaurant, will suddenly decide when pulling into the parking lot that it is time lose their damn mind. The parking lot is a cue to party like it’s 8:30pm on a Friday night. Cue the yelling, cue the running through the parking lot, cue attempts to remove clothing. Because every toddler knows that shoes and socks make for a less pleasant dining experience. When it is time to order you will not make the right choice. Trust me on this. Order one meal for your two children because they never finish one? They will act like they’re starving and make you look like a horrible parent trying to save a buck. Order two meals because last time they acted like they were starving and made you look like a cheapskate? They will decide to go on hunger strike. Your toddler will decide her rice looks better on her chair and on the floor. Side note--your toddler at this point may act like she has had a change of heart and will offer to help clean up. Do not let your toddler help you clean up. Their idea of helping is to nearly knock down a piece of pottery and then exclaim “tada!” like you should be impressed that they didn’t knock down something large and breakable. You will then try cute attempts to get your toddler to eat. Things like “can you make that quesadilla go in your belly?” You will then spend the next 5 minutes removing quesadilla parts from your toddler’s belly button. You may think that I’m over-reacting when I say you should just wait until your kids are 18 to take them out to dinner. Maybe you’re right. But if you’re wrong and decide to try it anyway, have fun removing your meal of choice from your toddler’s belly button. I sersioulsy cringe every time we are invited out to dinner with friends... and I mean cringe. There are not enough crayons in the world to keep that toddler busy. I don't know how many time we've gone out to eat as a family, only to have one of us outside with the kid, while the other is scarfing down dinner or waiting for to-go boxes. Oh fun...where did you go? !